In the first post in this series, I gave an overview of all of the various types of metadata offered by WordPress, where it's kept, and what we're going to be covering throughout this series. Further, I defined what metadata is; its role within WordPress, and how it's relevant to us as developers. But the introduction was meant to be just that: a survey of what we're going to be covering throughout the rest of this series. Starting in this post, we're going to begin exploring the WordPress Post Meta API to see why it's useful, what we can do with it, and how to take advantage of the methods offered via the WordPress application. First, if you're an advanced developer, then it's not likely this series of tutorials is going to be of much help to you. Instead, it's geared more towards those who have worked a little bit with themes, perhaps tweaked some plugin code, and are ready to take it a step further by adding some extra information to the posts (or the post types) that compose their project. Secondly, note that the code examples in this tutorial are not for use in a production environment. Instead, the code we're going to be looking at is not meant to be used anywhere that anyone has public access to the site. Right now, I'm planning to cover more advanced techniques for this topic after we work our way through this series. But for now, we're only going to concern ourselves with working with the API. Why, though? What's the delay in covering additional information? Simply put, it has to do with website security. Specifically, whenever we're writing information into the database, we have to assume that the data is not in a format that's safe for us to store; we have to sanitize the data. There's an entirely different set of APIs for sanitizing data we need to explore that will work in conjunction with the metadata APIs, but this is not the tutorial for doing so. I know, it may sound a little frustrating to talk about these APIs without being able to leverage them. Remember, though, this is meant to be an introduction to the API. The tutorials should provide enough information for you to get started working with post metadata on your machine, but should also leave enough questions such that we can take a deeper dive into the topic in a future series of articles. With that said, let's go ahead and get started with the WordPress Post Meta API. And be warned: This is a long tutorial. But feel free to use whatever you like most. As long as you can view the data in the database, you're ready to go. WordPress has the ability to allow post authors to assign custom fields to a post. This arbitrary extra information is known as meta-data. Meta-data is handled with key/value pairs. The key is the name of the meta-data element. The value is the information that will appear in the meta-data list on each individual post that the information is associated with. In simpler terms, WordPress allows us to write custom information to the database, associate it with any post we'd like, and then retrieve it as needed. Further, the information is stored using unique key/value pairs. If this sounds foreign to you, don't even worry about it. The idea is that for each value that you store, it's related to a unique key (much like a doorknob has a unique key for unlocking it). The key is how we can retrieve the value from the post. But this does raise a question: What happens if a post has multiple pieces of metadata associated with it? That is, if any given post can have multiple pieces of metadata stored alongside it, how do we retrieve unique metadata? As we'll see when we begin looking at some of the example code below, in addition to using the key used when storing data, we also need to pass the post's unique ID to the function. Nothing works better than seeing it in action, though. So assuming that you have WordPress set up on your local machine and that you're okay with editing functions.php in the core of your default theme, let's get started. The most important thing is that you're running both WordPress and the theme mentioned above. Finally, if you're more comfortable with another IDE and database front-end, that's completely fine. We've covered a lot of information in the introduction of this article, but it will come in handy as we begin to look not only at the Post Meta API but the other APIs, as well. So keep this mind. I'll be referring to this particular article in future articles, too. Let's dig into the API. The way we're going to incorporate the code is not the professional way of making changes to your theme, implementing this functionality, or interfacing with an API. We are doing this for a beginner's first steps into WordPress development. In a follow-up series, we're going to take the work we've done in this series and extract it into a more maintainable plugin that also includes a greater focus on maintainability, security, and more. For now, we're focusing on the basics of the API. Remember that I'm using a basic installation of WordPress along with the twentysixteen theme for the demos that we're going to see throughout this tutorial and the rest of the tutorials in the series. Secondly, we're going to be making changes in functions.php. This is usually not the best place to make this change; however, please make sure that you've read the note above before proceeding. The challenge with working with functions.php is that it's already full of code that helps power the existing theme. Though we'll ultimately move our code into a plugin in a future series, let's at least take the first step in making our file so that we can self-contain our code. 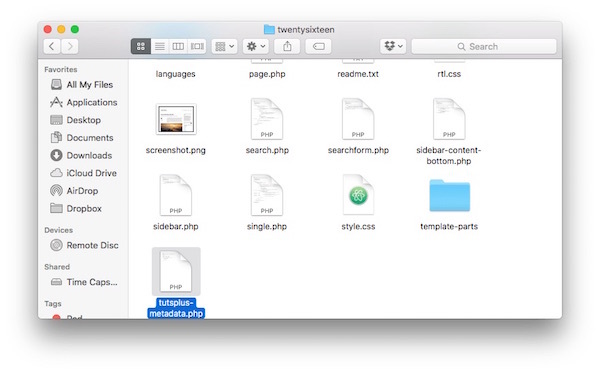 Create a new file in the root directory of the twentysixteen theme. Finally, we need to make sure we include this in functions.php. To do that, add the following line of code just under the opening PHP tag. Reload your browser. If all goes well, you should see the theme exactly as it was before adding your file to functions.php. For this tutorial, all we're concerned with doing is adding metadata that will appear on the default Hello World! post that comes standard in each installation of WordPress. Let's say that we want to add some metadata that includes our name. So the meta key we'll use is my_name and the value that we'll use is whatever your name is. In my case, it's "Tom McFarlin". The first thing we want to do is to define a function that hooks into the_content. This will allow us to output our text when the function runs. If you're not familiar with hooks, then please read this series. When you execute this code, the string "[We are here.]" should appear above the post content before anything else, and it should only happen on the Hello World! post. This is because we're checking to make sure the ID is 1 before we echo the string. Note that the final version of the code shared at the end of this post will be complete with comments. Until then, I'll be explaining what the code is doing as we add each new piece to our code. Now let's add some actual metadata. To do so, add this code in the body of the conditional so that we're sure that we're doing so for Hello World. Since we're already checking for the ID of 1 in the conditional, then we can just remove the code we added in the previous section and update it. It'd be nice if we could do something with this information. Before we do that, though, there's some more information we need to cover. Namely, about updating metadata (and how it differs from adding metadata) along with some nuances you may not expect when dealing with the API. There's a subtle difference between adding metadata and updating metadata. You know how a key uniquely identifies a value that's associated with it? Well, that's partially accurate. Note that if the given key already exists among custom fields of the specified post, another custom field with the same key is added unless the $unique argument is set to true, in which case, no changes are made. Ah, there's an optional parameter that the function accepts. It's a boolean called $unique, and it allows us to pass true if we only want to make sure that the value that's added is unique. You may want to delete your existing records at this point. If not, that's fine—just use a different value for the my_name key. Now you're only creating a single entry. Furthermore, if you were to try to change the value of that key in the code, then it would not be overwritten in the database. Once writing the post metadata is complete, it's stored as it was the first time. But it doesn't have to be that way, and that's where update_post_meta comes into play. In fact, update_post_meta might be used more than add_post_meta, depending on your use case. The function update_post_meta() updates the value of an existing meta key (custom field) for the specified post. This may be used in place of add_post_meta() function. The first thing this function will do is make sure that $meta_key already exists on $post_id. If it does not, add_post_meta($post_id, $meta_key, $meta_value) is called instead and its result is returned. You will overwrite the previous value. This brings some inherent dangers with it, though. Namely, if you overwrite a value that you never intended to overwrite, then that value is gone, and it can't be reclaimed (unless you do fancier work that's outside the scope of this series). There's an optional final argument for update_post_meta, though, and that's the $prev_value argument. That is, you can specify which value you want to overwrite. Take, for example, the case where you have multiple records with the same key created with add_post_meta and you want to update only one of those records. To update that data, you'd pass in the value corresponding to that one record. The difference between add_post_meta and update_post_meta may be considered subtle, but it depends on your use case. I'll try to break them down as simply as possible here because, although it may seem complicated given the examples that we've seen above, it's more straightforward when you lay it all out. add_post_meta is useful when you want to introduce a record into the database. If the value already exists, then the new value may or not be written. If you pass true for the $unique parameter of the function, then only the first record will be created, and nothing will overwrite that except update_post_meta. update_post_meta can be used in place of add_post_meta and will always overwrite the previous value that existed. If you're working with multiple records created by add_post_meta, then you may need to specify a previous value that you wish to overwrite. And that's everything. Of course, we still have to deal with retrieving the records from the database and displaying them on the screen. Metadata can be retrieved as a string. Metadata can be retrieved as an array. Sometimes it depends on how you stored the original information; other times it's based on how you want to work with it. Before we look at the various ways we can retrieve information, let's first look at the basic API call for doing so. Specifically, I'm talking about get_post_meta. If you've been following along so far, then understanding the API should be relatively easy. Retrieve post meta field for a post. Will be an array if $single is false. Will be value of meta data field if $single is true. Seems easy enough. So given where the last bit of our source code sits right now, I'd say we can retrieve information by making a call such as get_post_meta( get_the_ID(), 'my_name' );. The code, as it stands above, will return an array. Whenever you hear the phrase "multiple values", it can be helpful to think of an array or some type of data collection in the programming language you're using. If I were to retrieve the information by its key, what would I get back? Since I didn't specify that I wanted a string, I would get back an array of all of the records. This would allow me to iterate through each of them. If, on the other hand, I were to specify true for wanting to get back a string, then I'd only get the first row that was created using add_post_meta. Note that I'm using var_dump to make it easier to see what information is returning from WordPress within the browser; however, I'm more of a fan of using a debugger, which is something that we may discuss in a future post. Now let's say that you want to get single values stored for one post. In this case, you still need the post ID and the metadata key; however, you'll also need to provide true as the third parameter to get_post_meta. As mentioned above, if you're dealing with a situation in which multiple rows have been created using add_post_meta, then you're going to get back the first row that was created; however, if you're using this function alongside update_post_meta then you'll get back a string value of the data that was stored. And then you'll get back whatever value you saved as the meta value when making a call to the function. It's pretty simple in comparison to having to work with a set of records and arrays that may or may not contain similar information. 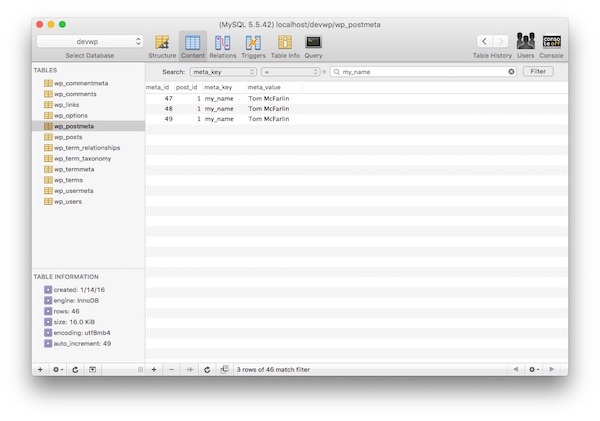 The last bit of working with post metadata has everything to do with being able to delete it. It's easy, but there are just a few nuances that we need to understand to make sure we're doing it effectively. This function deletes all custom fields with the specified key, or key and value, from the specified post. The meta value is optional, but it comes in handy if you've been working with add_post_meta and want to delete one of the specific entries created by multiple calls to that function (as we've seen elsewhere throughout this tutorial). Although making a call to delete_post_meta is as simple as passing a post ID, the meta key, and the optional meta value, the function returns a boolean value stating whether or not the data was removed. However, your implementation may vary. If you're working with multiple pieces of metadata and if you want to verify that it was a successful deletion, then you may wrap the code in a conditional. Below you're going to find a long, documented code snippet that should represent the majority of what we've talked about in this tutorial. Note that the functions are hooking into the_content. This is just for demonstration purposes so that you can easily trigger the firing of these functions whenever you load a particular page. * This file shows how to work with the common Post Meta API functions. * commented out depending on which action you really want to test. * adds my name as the post meta data to the postmeta database table. * @param		string $content		The post content. * @return	 string $content		The post content. * discussed in the linked tutorial. * it back to the browser. // Note: Don't worry about the esc_textarea call right now. * deletes the post metadata identified by the unique key. Typically, you'll find metadata functions associated with other hooks such as save_post and similar operations, but this is a topic for more advanced work. Perhaps we'll cover that in another series later this year. 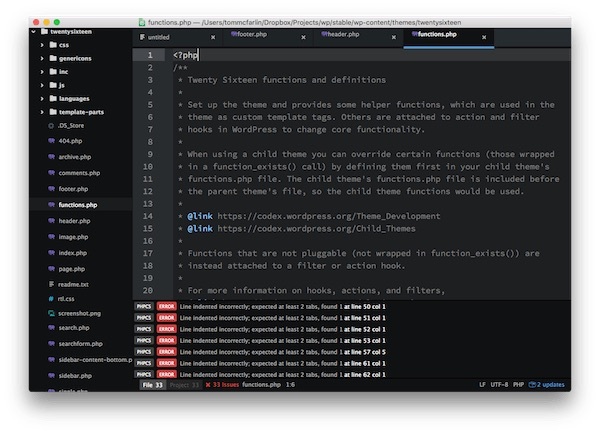 Every single one of the API functions is available in the WordPress Codex, so if you'd like to jump ahead and do some more reading before the next article in the series, then feel free to do so. As previously mentioned, this is an introduction to the WordPress Post Meta API. Through the information provided in the Codex, in this tutorial, and in the source code provided, you should be able to begin writing additional content to the database related to each of your posts. Remember, though, this is meant for demonstration purposes as we have more information to cover. Specifically, we need to examine data sanitization and data validation. Though we have additional topics to cover first (such as user metadata, comment metadata, and so on), we'll move on to more advanced topics soon. Ultimately, we're trying to lay a foundation for future WordPress developers to build from when they go forward and work on solutions for others, for their agencies, or even for their projects. With that said, I'm looking forward to continuing this series. Remember if you're just getting started, you can check out my series on how to get started with WordPress, which focuses on topics specifically for WordPress beginners. Remember, you can catch all of my courses and tutorials on my profile page, and you can follow me on my blog and/or Twitter at @tommcfarlin where I talk about various software development practices and how we can employ them in WordPress. Please don't hesitate to leave any questions or comments in the feed below, and I'll aim to respond to each of them.